Whenever you are working on something that changes over time, it’s useful to be able to track those changes. This can be for a number of reasons: it gives you a record of what changed, how to undo it, who changed it, and possibly even why. Version control systems (VCS) give you that ability. They let you commit changes to a set of files, along with a message describing the change, as well as look at and undo changes you’ve made in the past. Most VCS support sharing the commit history between multiple users. This allows for convenient collaboration: you can see the changes I’ve made, and I can see the changes you’ve made. And since the VCS tracks changes, it can often (though not always) figure out how to combine our changes as long as they touch relatively disjoint things. There a lot of VCSes out there that differ a lot in what they support, how they function, and how you interact with them. Here, we’ll focus on git, one of the more commonly used ones, but I recommend you also take a look at Mercurial. With that all said – to the cliffnotes! not quite.. you need to understand the data model. we’re going to skip over some of the details, but roughly speaking, the core “thing” in git is a commit. probably don’t want to store big files that change! the output here actually gives us a good starting point. let’s dig in and make sure we understand it all. don’t want to use hashes all the time. branches are names that point to hashes. master is traditionally the name for the “latest” commit. every time a new commit is made, the master name will be made to point to the new commit’s hash. let’s skip over “No commits yet” because that’s all there is to it. every commit contains a diff with all the changes you made. but how is that diff constructed in the first place? while you’re playing with the above, try to run git status to see what git thinks you’re doing – it’s surprisingly helpful! okay, we have a commit, now what? if NAME is a commit hash, git says we’re “detached”. this just means there’s no NAME that refers to this commit, so if we make commits, no-one will know about them. applies the diff in the commit at NAME in reverse. we can compare an older version to this one using git diff NAME..
a..b is a commit range. if either is left out, it means HEAD. we can show all the commits between using git log NAME..
huh, why? wasn’t reset to change staged changes? reset has a “second” form (see git help reset) which sets HEAD to the commit pointed to by the given name. clearly, names are important in git. and they’re the key to understanding a lot of what goes on in git. so far, we’ve talked about commit hashes, master, and HEAD. but there’s more! you’re still “on” master though, so if you make a new commit, master will point to that new commit, b will not. tags are other names that never change, and that have their own message. often used to mark releases + changelogs. add feature x – maybe even with a commit message about x! note that this changes the previous commit, giving it a new hash! what it really does: rewind HEAD to rebase start point, then re-apply the commits in order as directed. git reset --hard NAME: reset the state of all files to that of NAME (or HEAD if no name is given). handy for undoing changes. 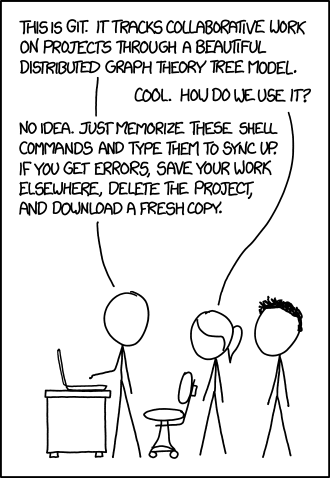 a common use-case for version control is to allow multiple people to make changes to a set of files without stepping on each other’s toes. or rather, to make sure that if they step on each other’s toes, they won’t just silently overwrite each other’s changes. git is a distributed VCS: everyone has a local copy of the entire repository (well, of everything others have chosen to publish). some VCSes are centralized (e.g., subversion): a server has all the commits, clients only have the files they have “checked out”. basically, they only have the current files, and need to ask the server if they want anything else. every copy of a git repository can be listed as a “remote”. you can copy an existing git repository using git clone ADDRESS (instead of git init). this creates a remote called origin that points to ADDRESS. you can fetch names and the commits they point to from a remote with git fetch REMOTE. all names at a remote are available to you as REMOTE/NAME, and you can use them just like local names. often you’ll use GitHub, GitLab, BitBucket, or something else as your remote. there’s nothing “special” about that as far as git is concerned. it’s all just names and commits. if someone makes a change to master and updates github/master to point to their commit (we’ll get back to that in a second), then when you git fetch github, you’ll be able to see their changes with git log github/master. so far, branches seem pretty useless: you can create them, do work on them, but then what? eventually, you’ll just make master point to them anyway, right? what if you had to fix something while working on a big feature? what if someone else made a change to master in the meantime? once your big feature has been finished, you can merge its branch into master, and git will ensure that you don’t lose any changes from either branch! open the conflicted file in your editor and look for lots of angle brackets (<<<<<<<). the stuff above ======= is the change made in the HEAD since the shared ancestor commit. the stuff below is the change made in the NAME since the shared commit. once you’ve resolved the conflict by figuring out what the file should now look like, stage those changes with git add. when you push, git checks that no-one else’s work is lost if you update the remote name you’re pushing too. it does this by checking that the current commit of the remote name is an ancestor of the commit you are pushing. if it is, git can safely just update the name; this is called fast-forwarding. if it is not, git will refuse to update the remote name, and tell you there have been changes. if your push is rejected, what do you do? force the push with --force: this will lose other people’s changes! there’s also --force-with-lease, which will only force the change if the remote name hasn’t changed since the last time you fetched from that remote. much safer! if you’ve rebased local commits that you’ve previously pushed (“history rewriting”; probably don’t do this), you’ll have to force push. think about why! On a repo try modifying an existing file. What happens when you do git stash? What do you see when running git log --all --oneline? Run git stash pop to undo what you did with git stash. In what scenario might this be useful? If a file is mistakenly modified in some commit it can be reverted with git revert. However if a commit involves several changes revert might not be the best option. How can we use git checkout to recover a file version from a specific commit? Git also lets you define global ignore patterns under ~/.gitignore_global, this is useful to prevent common errors like adding RSA keys. Create a ~/.gitignore_global file and add the pattern *rsa, then test that it works in a repo. Once you start to get more familiar with git, you will find yourself running into common tasks, such as editing your .gitignore. git extras provides a bunch of little utilities that integrate with git. For example git ignore PATTERN will add the specified pattern to the .gitignore file in your repo and git ignore-io LANGUAGE will fetch the common ignore patterns for that language from gitignore.io. Install git extras and try using some tools like git alias or git ignore. Git GUI programs can be a great resource sometimes. Try running gitk in a git repo an explore the differents parts of the interface. Then run gitk --all what are the differences? Once you get used to command line applications GUI tools can feel cumbersome/bloated. A nice compromise between the two are ncurses based tools which can be navigated from the command line and still provide an interactive interface. Git has tig, try installing it and running it in a repo. You can find some usage examples here.